North And South Korea Dismantle Loudspeakers Blaring Propaganda On The DMZ : The Two-Way The removal comes after a historic summit between South Korean President Moon Jae-in and North Korean leader Kim Jong Un, who pledged a "complete denuclearization" of the Korean Peninsula. On Tuesday, South Korean soldiers dismantled loudspeakers that broadcast propaganda at the demilitarized zone separating the two Koreas. 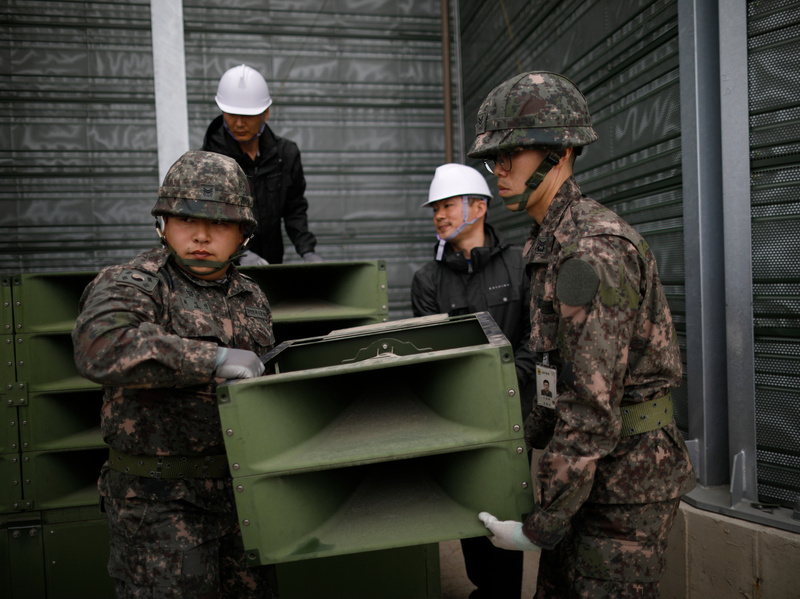 Along the fortified border that divides the Korean Peninsula, soldiers in both North and South Korea began dismantling loudspeakers that for decades helped wage a war of words — blaring propaganda over the armistice line. South Korean soldiers in helmets and gloves took down their country's loudspeakers in front of journalists and snapping cameras on Tuesday. North Korea started to remove its speakers earlier in the day, a South Korean military officer told The Associated Press. Both Koreas switched off their broadcasts in anticipation of last week's historic summit between South Korean President Moon Jae-in and North Korea's Kim Jong Un. After the meeting last Friday, the two leaders announced that they had agreed to a peace treaty and the "complete denuclearization" of the Korean Peninsula. The speakers were a longtime fixture at the 151-mile border, broadcasting propaganda since the 1960s, years after the Korean peninsula was split in two. South Korea's stream of noise evolved to feature not just anti-communist propaganda, but news, weather forecasts and K-pop music. The speakers blared at unexpected hours of the day, in response to North Korean nuclear tests and land mine explosions. Broadcasts could be heard 12 miles into North Korea as part of what the South Korean military deemed "an effective tool in psychological warfare," NPR's Elise Hu reported. North Korea countered with its own messages that praised its country and berated the "depraved capitalist" South. Those broadcasts were reportedly less loud and were prone to technical issues because of electricity shortages. Over the years, the countries brokered deals of silence only to hear them fail as tensions escalated. The broadcasts stopped for 11 years between 2004 and 2015, and then South Korea resumed them after soldiers were injured by border landmines. "The broadcasts were later halted again in 2015 but re-started in 2016 in response to the North testing a hydrogen bomb," the BBC reported. Sound isn't the only way that propaganda has been delivered at the demilitarized zone. In 2014, for example, defectors from North Korean used balloons to scatter anti-Pyongyang leaflets, DVDs and U.S. dollar bills over the border. That prompted North Korean forces to open fire and South Korean forces to return in kind.